I can't understand why people always need to eat cold stuff in summer and warm stuff in winter. I live in Dubai, It's July, one of the two hottest months of the year (besides August) with temperatures between 38 and 43 degrees Celsius during the day and never less than 30 degrees at night. It is hot outside, yes, but modern technology has provided us with air-conditioners and no-one with common sense would spend more time than necessary outside anyway. People have their coffees and teas hot all year round, so what's the fuss about hot and cold food in summer and winter? So why not eat something nice and warm to start the day in my nicely down to 23 degrees cooled down kitchen to start the day? 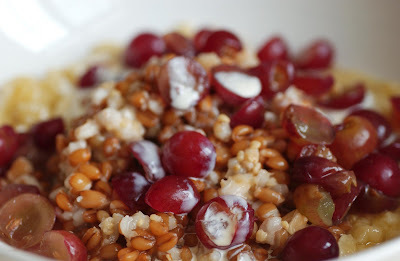 Cook the wheat berries in water (1 part berries, three parts water, half a teaspoon of salt) for about an hour. If the berries are soft and chewy they are ready. This can be done in advance and in even bigger amounts the evening before. At breakfast time, mash a banana in a bowl, add the desired amount of wheat berries (depending on your hunger) and a splash of cream. Cut the grapes into halves or quarters and sprinkle them on top. Stir everything and heat it up a little (not to boiling point - just enough to make it a warm breakfast) and serve immediately. 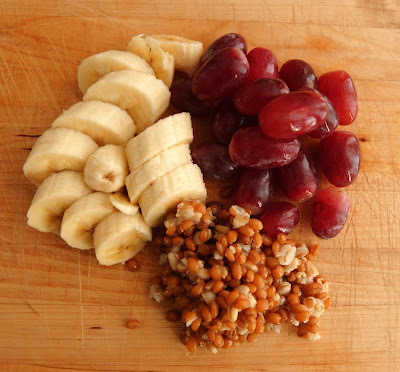 The wheat berries can be replaced by a mix of whole grain berries, like barley, rye, oats. The fruit to sprinkle on top are also replaceable. I had this breakfast with cut-up mango, pears, strawberries and it all worked fine. They should be rather sweet though, since the sweetness comes out even better when the fruit is slightly warm. The mashed banana, however, is irreplaceable to me. They give a nice sweetness that makes all other sorts of sweeteners like syrups etc. unnecessary.